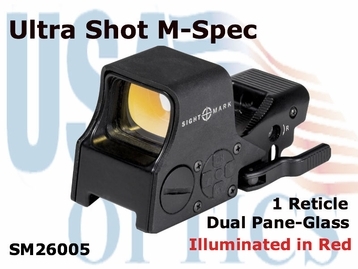 Featuring a digital switch control with six variable brightness levels for daytime use and six settings in night vision mode, the new Sightmark Ultra Shot M-Spec Reflex Sight (SM26005) is built for adaptation to any shooting environment. Its magnesium alloy housing offers exceptional durability along with a battery life of up to 1,000 hours of superior functionality. The device features a protective hood that shields it from impact and a shock-proof frame for up to .50 caliber recoil. Fully submersible up to 40 feet of water, the Ultra Shot M-Spec is equipped with dual-pane glass and a parallax-corrected lens system, allowing shooters to sight accurately from 10 yards to infinity.